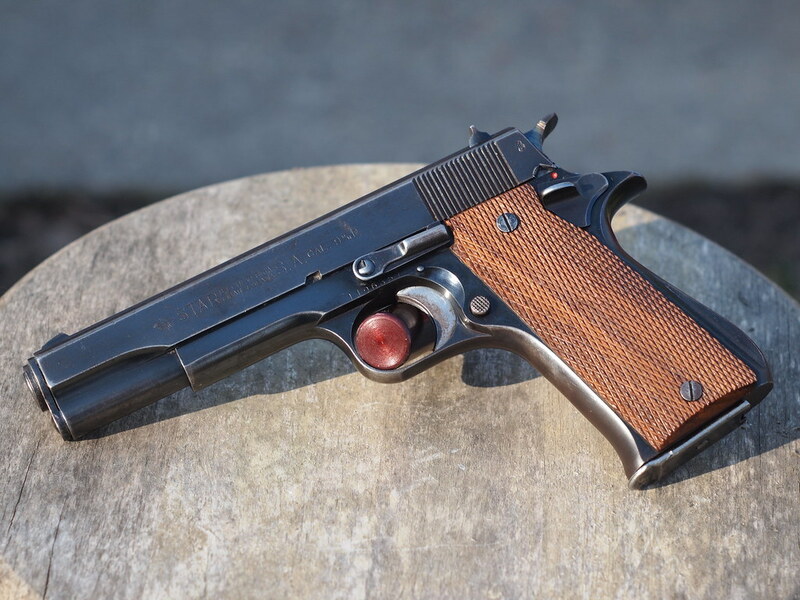 Here's mine, I put some wooden grips on (I've kept the original plastic, but tucked them away). Reasonably clean condition, considering the age, and a slick shooter. Got mine back when J&G had them, came with 2 magazines and the (Spanish) manual. Wow pretty clean example. Another one that is on my wish list. I don't think my list will ever get shorter as I keep adding to it. Grips look nice on it. These are surprisingly good pistols. I have a 1943 Model B (non-Super) and a Model B Super from the early 1960's. The design improvements in the Super are very well thought out. I've noticed that several Model A and B Supers that I have seen in recent years (mine included) are afflicted with weak hammer springs. I know of no source of replacement springs. Even Wolff doesn't carry them. Mine in particular is only 100% reliable if I reload using Federal primers or shoot Federal factory ammo. Accuracy-wise, both of my Stars shoot better than I can hold. It's a shame that they have become dinosaurs in this Brave New World of polymer frames. Love old steel framed guns. I never jumped on the ownership of a Star, but I sure have enjoyed shooting them! Yeah, these really are some great pistols. I'm fortunate that everything seems to function fine with mine, no issues with springs. 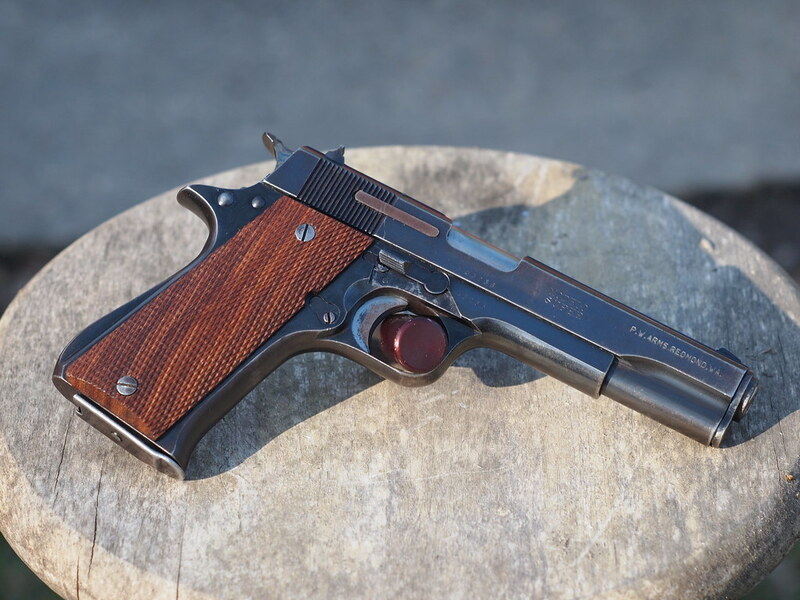 It's one of the most accurate pistols I have- we loaded up and went to an outdoor range about 50 mi from my house, a public range that only requires you to have a hunting or fishing license of some sort (on the grounds of a Wildlife Management Area). The pistol range goes out to 100 yds, and has a berm behind it. Using your standard 115 gr fmj (I think it was S&B), I was consistently able to bounce some paper plates around on the berm, shooting while standing. I brought a fair number of pistols out there, and the only other ones I was able to do that with were a couple of 22's. It's definitely worth owning one! The one I have is really well made, everything is very slick and precise. There's no slop or wiggle to anything. The super B is one of my latest acquisitions and I also love it. Worth every penny. I just wish replacement parts were a little more available. If you are on the fence about it I would recommend buying one. Nice I love the look of these. Haven't seen any for sale locally, I like to handle wepons before I buy them. But that siad it's on my bucket list of guns I want.